The United Auto Workers International Executive Board nullified the vote of a major California union that endorsed a boycott of Israel on behalf of Palestinian rights, even while admitting that the vote was thoroughly democratic. Documents obtained by Salon show how UAW executives cited political reasons in their opposition to the local’s vote. Further records show how the small pro-Israel opposition appealed and derailed the landslide vote with the help of a prominent law firm that has defended powerful multinational corporations like Wal-Mart, Amazon, Apple and Chevron. Activists in the union — representing workers in the University of California system — told Salon they feel UAW International is putting powerful interests over the democratic will of its own rank-and-file members. 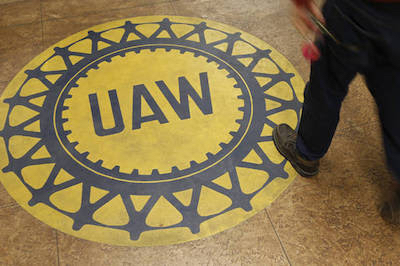 UAW initially responded to Salon’s request for comment by noting it received the message, but failed to reply to three more requests for comment over three weeks. UAW Local 2865, the labor union representing more than 14,000 teaching assistants and other student workers at nine of the campuses in the University of California system, made history in December 2014. It became the first major U.S. labor union to vote to endorse BDS — or Boycott, Divestment and Sanctions, an international grassroots movement that promotes nonviolent economic means to pressure Israel into complying with international law and respecting Palestinian rights. A Local 2865 officer who spoke with Salon but asked to remain anonymous stressed the importance of the BDS vote. The measure was brought forward to leaders by rank-and-file members, in response to a call from the Palestinian labor movement. Rank-and-file members of the local discussed the issue in more than four months of town hall meetings, debates and educational forums. UAW 2865’s elected leaders also gave members of the anti-BDS opposition platforms to share their perspectives. Rank-and-files members endorsed the resolution in a landslide, with close to two-thirds (65 percent) of votes in favor. More members of the union participated in the BDS vote than in their local’s own general election, or in the vote on the contract regarding their own jobs and benefits. The BDS vote also inspired a rapid increase in enrollment in the union. The officer emphasized to Salon that the widespread participation and rapid growth in the union because of the BDS vote was how grassroots democracy looks in practice. A year after the vote, however, the UAW International Executive Board, or IEB, issued an appeal decision informing UAW 2865 that it had “nullified” the local’s vote — even while the IEB simultaneously applauded the thoroughly democratic and fair nature of that vote. The IEB’s nullification was announced on Dec. 15 in a response to an appeal by Local 2865 member Stephen Brumbaugh. Brumbaugh is an outspoken member of Informed Grads, the anti-BDS opposition group. The IEB allowed this small pro-Israel contingent to compromise a resolution that was overwhelmingly supported by two-thirds of rank-and-file members of his local. On Dec. 16, Informed Grads boasted that it had subverted the BDS endorsement via appeal. In a press release, the opposition group revealed that it had been represented by a partner at Gibson, Dunn & Crutcher, an international law firm that has defended some of the world’s largest corporations. Partners at Gibson, Dunn & Crutcher have also represented corporations that would potentially be targets of BDS resolutions like that passed by UAW 2865, including Raytheon, Northrop Grumman,Lockheed Martin, Boeing and more. The firm has been criticized several times in court recently while involved in headline-making cases, and has often defended corporations in opposition to left-wing causes. In a 2015 judgment, the England and Wales High Court determined that a suspended partner at Gibson, Dunn & Crutcher deliberately misled the court in a case involving the freezing of assets of a leading businessman and political rival in Djibouti. New Jersey Gov. Chris Christie hired Gibson, Dunn & Crutcher during the George Washington Bridge scandal, also known as “Bridgegate.” A federal judge blasted the firm for its behavior in the case in December 2015. In 2007, the State of California sued leading car companies, including GM, Toyota, Ford, Honda, Chrysler and Nissan. The government accused the corporations of creating a global warming-related “nuisance.” Gibson, Dunn & Crutcher defended the car companies, and helped them get the lawsuit dismissed. The law firm that assisted Informed Grads has also defended Wal-Mart against allegations of bribery, along with Amazon, Apple and more. “This result was due to a real team effort between our firm and Informed Grads,” he added. Edelman did not respond to three different requests for comment. The IEB’s decision to nullify the vote rested on several grounds. Firstly, the international board argued that allowing locals to make such a endorsement, even democratically, could economically impact members of other locals. Secondly, the executives invoked the no-strikes clause of the local’s contract, conflating a written request for divestment with actual work disruption. Thirdly, the international characterized the endorsement of BDS as anti-Semitic, even while it simultaneously acknowledged UAW 2865’s vocal and public opposition to anti-Semitism and all other forms of racism. In doing so, rank-and-file members accused the executives of ignoring the prominent Jewish leaders in the local who support BDS. In addition to calling on the University of California and UAW International to divest from Israeli state institutions, the BDS resolution that was passed in a landslide requested that the institutions also divest from and cease doing business with international corporations that are complicit in rights violations of the Palestinian people. 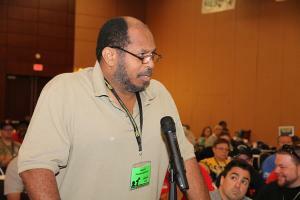 UAW 2865’s BDS Caucus condemned the executives’ argument. “The IEB’s support for the profits of these companies — their prioritization of the so-called ‘flow of commerce’ — trumps their support for other labor unions (such as the Palestinian labor unions that initiated the call for BDS) and their own members (like the 65 percent of affirmative voters from UAW 2865),” the caucus said. UAW did not respond to Salon’s request for comment about these criticisms. The IEB’s decision to nullify the vote also invoked the no-strikes clause of UAW 2865’s contract with the University of California. “Claiming that a written request for UC divestment from corporate war profiteers constitutes a serious disruption of the operations of the employer stretches even the wildest imagination,” the BDS Caucus argued. In reply to its argument, the BDS Caucus accused the IEB of ignoring human rights and failing to prioritize social justice. In its ruling, the IEB acknowledged these repeated commitments to anti-racism from UAW 2865 leadership, but still accused it of anti-Semitism. In response, the BDS Caucus also emphasized that Jewish and Israeli union members in fact led the campaign in favor of the BDS resolution. Dozens of Israeli and Jewish current and former members of UAW 2865 signed a letter supporting the resolution. Additionally, more than 700 Jewish community leaders, scholars, and activists signed another letter expressing support for the BDS resolution. Dozens more Jewish UAW 2865 members “have spoken repeatedly of how their Jewish values encourage them to combat all forms of racism and oppression, including the dispossession faced by Palestinians,” the BDS Caucus noted. A Jewish UAW 2865 officer who wished to remain anonymous also stressed in a message to Salon that the president, northern vice president and recording secretary — three out of eight officers, counting the two current vacancies — of the local are Jewish. As further evidence of its commitment to anti-racism, the BDS Caucus pointed out that UAW 2865 has also passed resolutions supporting the Black Lives Matter movement, gender equity, and the student movement in Ayotzinapa, Mexico, among others. The IEB never criticized the local for passing these resolutions. Salon has obtained copies of numerous messages outside groups have sent to UAW International, expressing support for UAW 2865’s BDS resolution and condemnation of the IEB’s nullification. The Executive Board of the American Studies Association; the Bay Area chapter of Jewish Voice for Peace; the U.S. Campaign to End the Israeli Occupation; the Boston Coalition for Palestinian Rights; Jews for Palestinian Right of Return; United for Justice with Peace; the U.S. Peace Council, the California-based All of Us or None; and the New York-based Palestine Solidarity Collective; along with representatives of other local U.S. unions and even a French union have sent statements of solidarity. Numerous rank-and-file members of Local 2865 also spoke with Salon, expressing their views on the IEB’s ruling. “At the end of the day, the IEB’s nullification of our vote does not erase the solidarity with Palestinians’ struggle for justice expressed by growing numbers of Jews and union workers in UAW 2865 and around the world,” Leibson added. Jennifer Mogannam, a rank-and-file member at UC San Diego, also lambasted the IEB’s ruling. “As Palestinians, we are recurringly charged with anti-Semitism (among other things) for simply asserting our connection to our homeland and even our mere existence,” Mogannam explained. Mogannam echoed concerns a UAW 2865 officer who asked to remain anonymous told Salon, that UAW’s international executives are undermining democracy in its locals. “I believe this decision not only calls into question the autonomy of local chapters, but it also exposes the contradictions that arise among labor unions that in theory are committed to social justice of those disenfranchised (i.e., workers), but in practice are easily swayed by corporate interest and threats by oppressive powers,” Mogannam said. “In this sense, the international’s decision to redact our grassroots achievements exposes a commitment to power as opposed to grassroots organizing for justice,” she added. The BDS movement is growing nationally and internationally. In the labor movement in particular, BDS is gaining ground. In the year since UAW 2865’s vote, the United Electrical Workers union and the Connecticut AFL-CIO also passed BDS resolutions. More locals in UAW and other unions are also presently considering holding votes to endorse BDS. An organizer in a UAW local at a school in New York — who asked that her school or identity not be revealed — that is presently considering a similar BDS campaign told Salon that she fears the IEB’s ruling will have negative repercussions on her local’s activity, and stifle its internal democracy. UAW 2865’s BDS Caucus said the local is appealing to the UAW Public Review Board. Ben Norton is a politics staff writer at Salon. You can find him on Twitter at @BenjaminNorton. 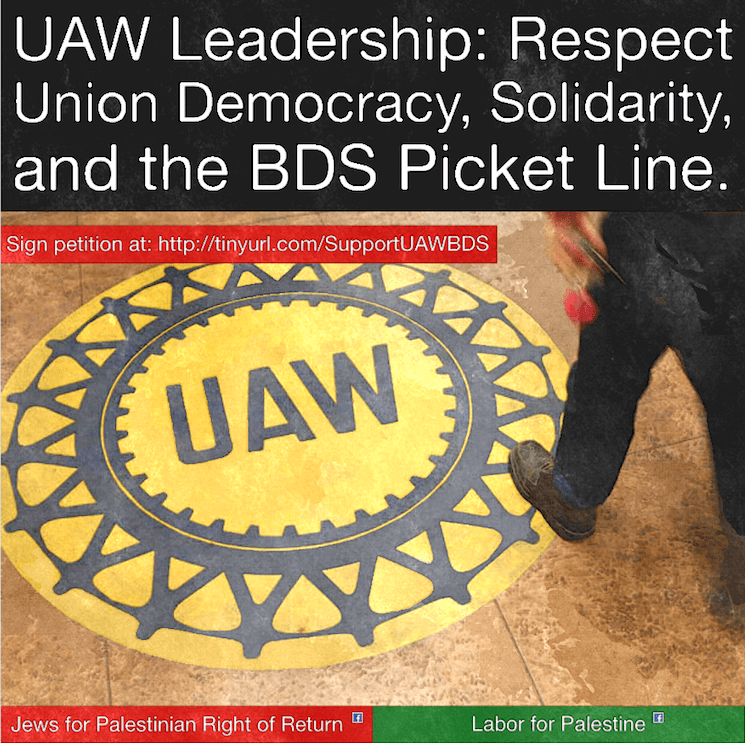 We are writing to oppose your recent nullification of the BDS resolution passed by UAW 2865. We firmly believe our International should respect the decision making power of local unions and bargaining units. We should begin by noting that, as the IEB itself has concluded, the resolution was passed by a democratic vote free of misconduct. Following the Israeli siege of Gaza in July 2014, members of Local 2865 approached their Joint Council to join the call from Palestinian trade unions to support the Boycott, Divestment and Sanctions movement. Though it was within its constitutional right to endorse the resolution, the Joint Council chose to hold a member vote. Following a series of educational forums and debates, the vote was held several months later in December 2014. 65 percent of voters supported the withholding of investments in companies “complicit in severe and ongoing human rights violations as part of the Israeli oppression of the Palestinian people.” This vote made UAW 2865 the first local union in the United States to endorse the boycott against Israel. The IEB was then approached by a law firm representing Informed Grads, a group of local union members opposing the resolution. In its case file, the firm included a number of letters from business and labor leaders expressing their disapproval of the vote, including the International Vice Presidents of the International Brotherhood of Teamsters and National President of the American Federation of Government Employees as well as the Director of Labor & Employment Relations at Caterpillar, whose equipment is used regularly for demolishing homes as well as factories, agricultural land and civilian infrastructure in the occupied Palestinian territories. We recognize that these efforts from both employers and allies put considerable pressure on the IEB. Nevertheless, we believe that, in the interest of building a robust union reinforced by bottom-up activity, the International should have prioritized its internal democratic process over the concerns of these other parties. Moreover, we find it disingenuous of the IEB to claim that Local 2865 broke its constitutional obligation of working toward the “solidification” of the labor movement. We might point out that, in the case of divesting from South Africa, anti-apartheid activism unified and strengthened the American labor movement in the 1980s. At a time when the BDS demand is gaining traction on university campuses and more broadly among progressive forces in this country, why can’t the labor movement play a similar role? And at a time when the UAW is spending a great deal of its new organizing efforts on academic workers, many of whom care deeply about this issue, why shouldn’t our union catalyze that struggle? It will be recalled that UAW divestment from South Africa was prompted by rank-and-file initiative. The legacy of our labor movement may have been different had the International isolated those efforts in the way it is attempting to now. As proud members of the UAW, we reject this attempt at marginalizing our comrades in Local 2865 and demand that the International reinstate their vote. On January 12, the National Labor Relations Board (NLRB) Region 6 dismissed an unfair labor practice charge brought by an Israeli law firm against UE over the union’s support of protests against Israeli policies. At its national convention in Baltimore August 16-20, 2015, UE adopted a resolution endorsing the Boycott, Divestment and Sanctions movement (BDS) to pressure Israel to negotiate peace with the Palestinians and end the occupation. UE is the first national U.S. union to endorse BDS. You can read the resolution by clicking here. On October 13, the Israeli law firm Shurat Hadin filed a charge with the NLRB alleging that UE’s resolution violated the prohibition in U.S. labor law against “secondary boycotts.” The union disputed the charge, arguing that Shurat Hadin’s action was an attempt to interfere with the First Amendment rights of the union and its members to express opinions on political and international issues, and also that the Israeli firm’s allegation were factually untrue. Shurat Hadin is an Israeli organization that uses legal cases to harass supporters of Palestinian rights and critics of Israel, a strategy known as lawfare. Its most infamous case was a 2011 lawsuit against former President Jimmy Carter for writing a book critical of Israel, Palestine: Peace Not Apartheid. The suit against Carter failed, as did a suit aimed at censoring Al Jazeera’s reporting. Its attacks on UE began Sept. 2, 2015 when Shurat Hadin wrote a letter to the CEO of the General Electric Company, UE’s largest employer, “warning” GE to “rescind its recently concluded labor agreement” with UE because Shurat Hadin didn’t like the union’s resolution on Israel and Palestine. The global BDS movement arose from a 2005 call by Palestinian trade unions and human rights groups. UE’s resolution also calls for a cutoff of U.S. aid to Israel and for U.S. support for a peace settlement on the basis of self-determination for Palestinians and the right to return. With its resolution UE joined the South African labor union confederation COSATU, Unite the Union in Britain and many other labor unions around the world in supporting BDS as a step toward justice and peace in Palestine and Israel. UE is an independent, member-run union representing 30,000 workers across the country in the private and public sectors. At its five-day convention last August member delegates acted on 37 resolutions on collective bargaining, organizing, and political issues. UE’s 2015 convention resolution, “Justice and Peace for the Peoples of Palestine and Israel”, upholds the union’s long tradition of courageous stands on foreign policy issues, which includes being the first union to oppose the Vietnam War, and its calls since the 1980s for a just and equitable solution to the Israeli-Palestinian conflict. Did a Major US Union Overrule Members on Palestine Solidarity? Members of a local Californian branch of United Auto Workers said Friday they were appealing a controversial decision by the larger union to overrule a pro-Palestine resolution backed by rank and file members. The United Auto Workers Local 2865 made history in late 2014 when its members voted overwhelmingly to support a boycott of corporations accused of involvement in Israel’s occupation of Palestinian territories. The vote was one of the most well attended in UAW 2865’s history, and came after months of intense discussion among union members. The union’s boycott resolution was framed as part of the international Boycott, Divestment and Sanctions movement, which has sought to use economic pressure to push Israel to end what human rights groups say are widespread human rights abuses in the occupied Palestinian territories. Supporters of the movement say their campaign is modeled on the 1980s anti-apartheid boycott of South Africa. UAW 2865 was the first major union in the United States to endorse BDS through a vote put directly to ordinary members. Since then, the United Electrical Workers union has followed suit, endorsing BDS during its 2015 conference. Internationally, BDS has also been backed by COSATU of South Africa and the Unite the Union in the U.K. However, in December 2015, UAW 2865’s parent union, International UAW surprised workers by nullifying the pro-Palestine vote, claiming the decision discriminated against Jewish union members. Now, a group of UAW 2865 members have told teleSUR they have begun an appeals process against the International UAW board’s decision. The members said they are seeking to overturn the nullification through the union’s public review board, after filing an appeal Thursday. They have argued the original UAW 2865’s BDS resolution was reached democratically by ordinary members, and said the larger union leadership should respect the demands of ordinary members. teleSUR has obtained union documents that some members of UAW 2865 say indicate some of the fiercest supporters of BDS within UAW 2865 were rank and file members identifying as Jewish – calling into question the International UAW’s primary reason for overruling the vote. There is also evidence of at least one multinational firm weighing in on the union’s decision. “But this is a distinction without a difference: boycotting Israeli academic institutions can only be carried out by discriminating against individuals associated with those institutions,” the member argued. However, internal union documents show the board was also contacted by a group of Jewish UAW 2865 members who firmly supported the BDS resolution. The UAW 2865’s rank and file BDS Caucus has accused the International UAW of effectively prioritizing the interests of companies like Caterpillar over the interests of union members. “Thus, the local union’s platform is apparent in its unfavorable stance against the state of Israel, Israelis and, invariably, Jewish union members,” the board said in its conclusion. However, Cavooris said Israel hasn’t been singled out by his branch at all, pointing to an extensive list of resolutions related to human rights issues from Mexico to China. “A brief scan of our political record shows that we are proud to stand against injustice against working people and others wherever it occurs,” he said. Yet disagreements over the board’s decision to label the BDS resolution as anti-Semitic aren’t the only concerns raised by rank and file UAW 2865 members. “The actions taken by UAW Local 2865 are without merit and set a dangerous precedent in our relationship,” Ginzel wrote to Jewell. The letter also included a paragraph supporting an appeal against UAW 2865’s resolution. The International UAW’s final conclusion expressed similar concerns to those raised in Ginzel’s letter, stating the BDS resolution could have blow back on union members employed by companies like Caterpillar. “The (board of the International UAW) support for the profits of these companies – their prioritization of the so-called “flow of commerce” – trumps their support for other labor unions, such as the Palestinian labor unions that initiated the call for BDS, and their own members, like the 65 percent of affirmative voters from UAW 2865,” the caucus said. The International UAW was invited to respond to these complaints, but didn’t respond by the time of publication. “When the (International UAW board) listens to executives at Caterpillar Inc. instead of workers in one of its locals, I think there is a clear breach of democracy and autonomy,” he said. “When workers at Caterpillar demand a wage increase in their next contract, is the UAW (international board) going to ensure that this demand is okay with Caterpillar management as well? Because we held a democratic vote on BDS – and the (board) acknowledges that it was completely democratic – we know we are representing the views and interests of our members. I wonder if the (board) can say the same, given their deference to Caterpillar management,” he said. Rank and file members of UAW 2865 that spoke to teleSUR likewise said they felt the International UAW was undermining local union democracy. “I believe this decision not only calls into question the autonomy of local chapters, but it also exposes the contradictions that arise among labor unions that in theory are committed to social justice of those disenfranchised (ie: workers), but in practice are easily swayed by corporate interest and threats by oppressive powers,” said Jennifer Mogannam, UAW 2865 member and Ethnic Studies PhD candidate at University of California, San Diego. “As stated, our efforts were transparent, honest and a two thirds vote in favor is telling of the commitment to justice that our generation of academic laborers upholds,” she said. The dispute between UAW 2865 pro-BDS members and the International UAW leadership may not end anytime soon, with the appeals process only just beginning. Members that spoke to teleSUR said that irrelevant of the board’s decision, they will continue to push for greater support for Palestine solidarity. “The struggle for Palestine is one symbol of struggle that we must continue to fight for and endure the repercussions of, alongside other struggles for true justice and liberation, because it is this commitment that may guide us to a new, just and better world,” Mogannam said. However, some members said the International’s decision could be a step backwards for workers’ and student rights. “I am worried about the ramifications of this decision on the democratic spirit of Unionism, and this struggle is far from over,” said Irene Morrison, southern vice president of UAW 2865. “It won’t end until Palestine is free,” she said. The International UAW was contacted for comment for this story, but didn’t reply by the time of publication. As you have heard, mainstream US labor institutions have a long history of complicity with Zionism. This is not only, or even primarily, an issue of ethnicity, i.e., pro-Zionist Jewish trade union leaders. Regardless of ethnicity, it is rooted the dominant anti-communism, business unionism, and racism of the labor bureaucracy. Moreover, even “progressive” labor leaders typically supported and identified with the Israeli state. This reflects not only political disorientation brought out by the Nazi Holocaust, but also the Soviet Union’s indispensable role in supporting partition and arming Zionist militias that carried out the Nakba. More recently, it also reflects an unwillingness to rock the boat, arguing for example, that the post-9/11 antiwar movement should exclude Palestine because otherwise “labor will walk,” which is to say, a loss of funding for antiwar NGOs. But today, the pro-Israel stranglehold in U.S. labor is beginning to fray at the edges, as reflected in ILWU Local 10 dockers’ refusal to handle Israeli cargo in 2010 and 2014, and BDS resolutions adopted over the past year by UAW 2865 at the University of California, the United Electrical Workers, and the Connecticut AFL-CIO. This is significant because trade unions are not just another venue for BDS resolutions. Rather, they have unparalleled potential to actually implement BDS job actions. This growing trade union support for BDS in the U.S. reclaims and reaffirms earlier traditions. In particular, it reflects past Black solidarity with Palestine, going back to Malcolm X, the Student Non-Violent Coordinating Committee (SNCC), and Black Panther Party, as discussed by other panelists at this conference. That, in turn, reflects more than two centuries of Black internationalism, dating back to the Haitian revolution at turn of 19th century, Seminole and other Native American resistance, and indigenous resistance to US occupation of Caribbean and Philippines in early 20th century. It is reflected in cutting-edge Black leadership of the Vietnam antiwar movement — including early draft resistance and the GI revolt — and in the South Africa anti-apartheid movement. Similarly, the earliest trade union anti-Zionism in the U.S. began with Black-Arab worker alliances in Detroit from 1969-1973. It is that history I want to focus on today. The first postwar challenge to Labor Zionism in the United States came from the Detroit-based League of Revolutionary Black Workers in January 1969, which recognized Palestinian oppression as a reflection of the same system of racism and colonialism suffered by black South Africans, Vietnamese, Latin Americans, and African Americans. 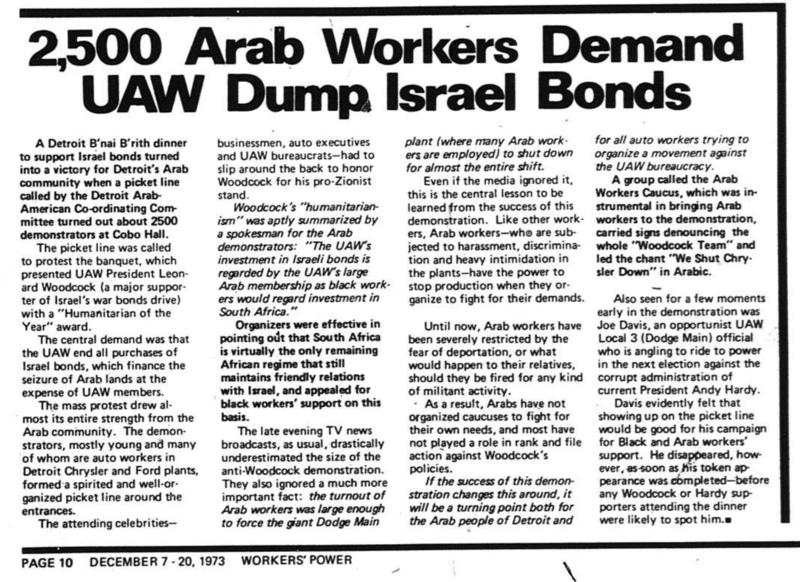 On October 14, 1973, Detroit was the site of the first industrial action against US labor officials’ support for Israel, when three thousand Arab autoworkers joined a wildcat strike to protest UAW Local 600’s purchase (without membership approval) of $300,000 in Israel Bonds. On November 28, 1973, Arab and other autoworkers struck to protest bestowal of B’nai B’rith’s “Humanitarian Award” on International UAW president Leonard Woodcock. To give you a flavor of what this actually looked like, read this article from Workers’ Power of December 7, 1973. That same day, New York City Labor Against the War (NYCLAW), a grassroots, interracial organization formed immediately after 9/11, linked its overall opposition to the “War Against Terror” by calling for an end to US military aid to Israel, Israeli withdrawal from the West Bank and Gaza, and support for the Palestinian right of return. NYCLAW also spearheaded unity between two separate coalitions behind a march in DC on April 20, 2002, the first post-9/11 national antiwar protest, in which 150,000 marched with the largest Palestinian contingent in US history. In April 2004, the Second National Convention of Al-Awda: The Palestinian Right to Return Coalition, adopted NYCLAW’s proposal for a campaign against US labor complicity with Israel. Toward that end, in October 2004, NYCLAW and Al-Awda New York jointly established Labor for Palestine, whose founding statement called on trade unionists to (1) fully support Palestinian national, democratic, and labor rights throughout historical Palestine, including the right of all Palestinian refugees to return to their homes and land; (2) demand an end to US military and economic support for Israeli apartheid; and (3) divest all labor investments in Israeli apartheid. Like other Palestine solidarity in recent years, Israeli war on Gaza has been the spark for growing trade union BDS. In response to “Operation Cast Lead” in 2008-2009, NYCLAW echoed the Congress of South African Trade Unions and other international labor bodies to reaffirm “support for the international Boycotts, Sanctions and Divestment campaign, including an immediate end to all support for Israel—including that provided by US labor leaders.” On December 4, 2009, Labor for Palestine issued an open letter challenging AFL-CIO president Richard Trumka’s opposition to BDS. Trade union BDS further escalated in the wake of Israel’s May 2010 attack on the Mavi Marmara, an unarmed Turkish merchant vessel carrying humanitarian relief to Gaza. On June 8, 2010, the ILWU Local 10 executive board unanimously condemned the massacre and issued a “call for unions to protest by any action they choose to take.” This statement was particularly significant, because ILWU members had refused to handle cargo for Nazi Germany (1934), fascist Italy (1935), Chile (1978), apartheid South Africa (1984), and US wars in Iraq and Afghanistan (2008). 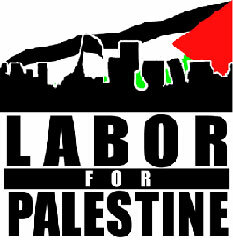 On June 9, 2010, 133 US trade unionists signed Labor for Palestine’s response, which reaffirmed the BDS call. Most importantly, on June 20, 2010, members of ILWU locals 10 and 34 in Oakland honored an eight-hundred-strong picket line against the Israeli-owned Zim Shenzhen ship—the first US labor-based BDS action. On July 29, 2014, the eighty-three member Joint Council of UAW Local 2865, representing thirteen thousand graduate student workers throughout the University of California, responded to Palestinian trade union and Labor for Palestine appeals by submitting a BDS resolution for a full membership vote. When the ship finally docked, ILWU Local 10 members responded to various pickets, some organized independently of AROC, by refusing to unload it for four consecutive days. Due to these and subsequent pickets, Zim line lost millions of dollars, and has abandoned attempts to return to Oakland or Los Angeles. Nine months later, the United Electrical Workers, a leftwing union with thirty-five thousand members, endorsed BDS. Significantly, both of these resolutions embraced the full BDS call, which demands not only an end to the 1967 occupation, but equality for Palestinians with Israeli citizenship, and refugees’ right of return. And this was followed shortly thereafter by the Connecticut AFL-CIO’s adoption of a BDS resolution. For more information about these issues, you are invited to visit LaborforPalestine.net, particularly our new article in American Quarterly, which is posted online at the above site. International executive officials at the United Auto Workers union last month overturned a December 2014 vote by its rank-and-file members to boycott Israel. UAW Local 2865 represents 13,000 graduate student workers across the University of California system. On Thursday, rank-and-file members and executive officers of Local 2865 filed an appeal to the UAW Public Review Board demanding the nullification be rescinded. Brumbaugh is a member of Informed Grads, a sub-group of Local 2865 which opposes the boycott resolution and unsuccessfully sought to have the resolution overturned by the local board in May of last year. But members of Local 2865 reject the claim of divisiveness and argue that the BDS campaign indeed furthers the interests of labor and workers’ rights. Palestinian trade unions were among the 170 civil society organizations that authored the 2005 international BDS call, activists point out. That call was reiterated by 15 Palestinian labor groups last year, urging international union members to step up efforts to boycott Israel. A corporate representative of Caterpillar, which profits from Israel’s destruction of Palestinian homes and property — and is one of several US corporations targeted for boycott under Local 2865’s resolution — sent a letter to the UAW executives pressuring the union to reject the boycott vote. It was submitted as part of Brumbaugh’s appeal. The union’s blunt protection of commerce and corporations is “indicative of the particular fears that the elite have about turning against capital and against other aspects of the establishment that are pro-Israel — or just multinational corporations that are invested [in Israel],” Salehi explained. “There is a strong prioritizing of the interest of the employers in commerce and in the flow of capital as opposed to the interest of the workers, who have an interest in solidarity,” he added. Brumbaugh’s appeal also asserts that the BDS resolution promotes “discrimination” against Jewish and/or Israeli workers, repeating claims by Informed Grads, Israel-aligned individuals and lobby groups that BDS activism in support of justice for Palestinians is inherently anti-Semitic. In nullifying the BDS resolution, UAW’s executives accept and duplicate Brumbaugh’s discrimination claims. The nullification, Palestine Legal adds, “is yet another example of anti-democratic maneuvers by institutional authorities in response to pressure from Israel advocacy groups” which aim to crush the growing support for the BDS movement and justice for Palestinians. Omar Zahzah, statewide executive board member of Local 2865 and a graduate student at UCLA, told The Electronic Intifada that despite the nullification, rank-and-file members are still energized and perhaps even more determined to continue the anti-oppression work in which the local has been engaged — especially around the struggle for justice in Palestine. “At the end of the day, an official decision can never take away the work that the rank-and-file has put into the campaign and the effect that that result still continues to have despite the nullification,” he said. Meanwhile, letters of support for Local 2865’s endorsement of the Palestinian-led BDS campaign have come from an array of organizations and individuals, including the president of the American Studies Association(ASA) which passed a historic resolution in 2013 to boycott Israeli academic institutions. “By appealing to narrowest possible conception of UAW members’ self-interest, the IEB [International Executive Board] effectively guts possibilities of broad progressive coalitions,” David Roediger, president of the ASA, stated in a letter seen by The Electronic Intifada. “That is, having allowed that Local 2865’s vote for BDS came in a democratic and fair election, the IEB apparently holds that because a boycott of Israel potentially harms, for example, a tiny portion of Caterpillar sales, it is impermissible for any local to support it,” Roediger added. The US Campaign to End the Israeli Occupation has set up an online petition “to urge the UAW IEB to not be on the wrong side of history” and reverse the nullification.